Several people have sent e-mails asking if I could post details of my training going into Badwater. They will certainly be way, way less impressive than some of the other ultra runner's that share their training regimens (like, for example, the bazillion miles that Anton puts in) but it will give you an idea of what this, middle-of-the-pack, average Joe runner is doing to prepare for a second go at the Badwater Ultramarathon. One thing to keep in mind is how difficult it is to get this training in. The need to catch a 7:57 AM train to work every morning means the alarm is permanently stuck at 4:30 AM during the week. When there are two runs in a day, unless I can sneak away from the job early, these usually occur after 7 or 8 PM at night. So, here goes nothing. Coming off a week of being sick with a weird shoulder injury that kept me to a mere 25 miles the week before, and knowing that this week would see a significant increase in mileage, I kept it to a simple cross training workout. One hour on the bike. 8.75 miles in 1:18:39 - Today was supposed to be a double day, with hill repeats in the morning followed by a short, easy run at night. The ramp up in miles just over the last two days had me feeling sluggish in the morning. Hit "snooze" one too many times = miss a workout. Brian Krogmann was sure to give me plenty of grief all day long for missing the AM run. 23 miles in 5:25:00 - I had pacing duties today at the North Face Endurance Challenge 50 Mile race at Bear Mountain, New York. Having trained at Bear Mountain before, I knew just what to expect. Rocky, technical trails with steep ascents and descents. It was a good opportunity to get in some "slower" miles and elevation gain (about 3,000 feet in all over the 23 miles). The only downside was the technical trails. I am not a technical trail runner. Well, at least I'm not that great at it. I left with a nicely swollen left ankle. Ice and a couple of beers helped to ease the pain a bit. 20 miles in 3:19:51. It was great to meet up with my good friends Shannon and Peter L. for a nice and easy 20 miles. We covered about 1,270 feet of elevation gain (thankfully, far less than yesterday) and fought some stiff headwinds and downed trees from the storms and high winds we've had over the last 2 days. The best news of all was that the ankle held up, although it was a bit stiff and sore. Way to go, Tony. Keep it up. I'm starting to do some two-a-days, thanks to my son being old enough to go with me in the running stroller. Wanna put in a nice 62 miles a week from Saturday? 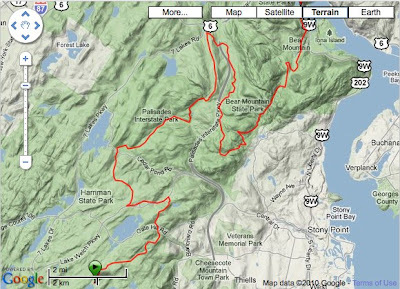 You should come to the South Mountain 100K in N.J. I see you have Pineland the next weekend, but it's all in good service for Badwater, right? Those 4:30 wake-up calls are tough...from what I've heard. Keep up the good work, Tony. This is the time to really hit the big miles for BW. I look forward to seeing you in the desert. Come on broseph. Pick up that training. Just quit your job and start running at least 20-30 miles a day.